I don't do many challenges online but at Inkurable Stampers I do. I believe it helps me to expand my creativity and to break away from the usual cut and pasting on ATC's in this particular challenge. 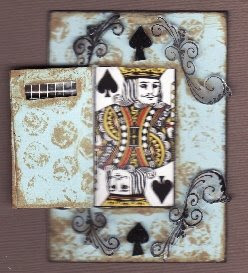 This month's challenge is to alter a playing card. Well I love doing that and I pondered on many ideas and sought some inspiration but nothing really jumped out at me. One day I said lets play with Shrinky Dink paper or Shrink plastic. So I first picked my playing card that I wanted to use. In this case the King of Spades. Then I cut a piece of blue cardstock and stamped it with bubble wrap with Tim Holtz distress ink in Tea Dye and also inked the edges for a suble look. Then I carefully positioned the top layer over the playing card and drew a small window to view just the face of the king. 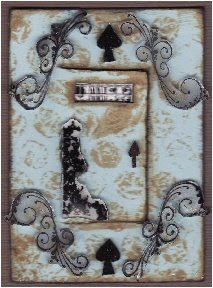 Then I carefully cut a door making sure I just had the middle section of the playing card showing when the door was open. I used a piece of drywall tape and placed it over the window, then cut a door size piece of paper and cut out another window and placed and glued it over the entire door inside the card. Now everything is concealed. Next I took an Inkadinkado flourish stamp and stamped in black on Shrink Plastic, making four stamps in black and I drew 3 spades and coloured them in with Sharpie permanent black marker. I cut all the pieces out carefully then shrunk them with my heat gun, great tool that is. Then I made sure while the shirnk plastic was still warm (and do NOT burn yourself) I flattened them with an eraser, sometimes the shrink plastic gets a bit distorted so to lay flat I make sure while it is warm I flatten it. Then I positioned all the pieces on and glued them carefully and let dry. I then inked the edges just a bit with black ink just to give it a little more oomph. This is called the House of Spades. I hope I win, but, if I don't, it was fun trying. lots of detail there.. beautiful card.. you did great..